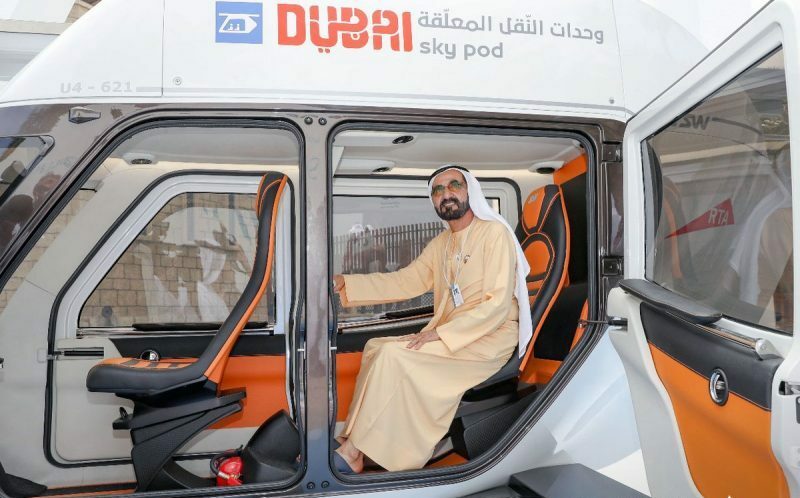 Sheikh Mohammed bin Rashid Al Maktoum, Vice-President and Prime Minister of the UAE and Ruler of Dubai, has reviewed two models of the Sky Pods, Dubai’s new autonomous vehicles. The mobility system is being tested by the Roads and Transport Authority (RTA) in conjunction with Skyway Greentech Co.
Sheikh Mohammed inspected the Sky Pods on the sidelines of the ongoing World Government Summit in Dubai. He also attended a briefing by Mattar Al Tayer, director-general and chairman of the RTA about the Sky Pod models. “The first model of the Sky Pods is the Unibike, which is characterised by its small size and lightweight,” said Al Tayer. Moving on steel wheels on a hanging railway, the Unibike combines the features of an electric vehicle along with sports and recreational features. It is fitted with electric systems for driving the pod. It can be fitted with a power generator such as the Bicycle Dynamo, and can also be driven by the body mass of passengers on board. It can accommodate two riders and travel at a speed of up to 150 km/h. The second model of the Sky Pods is the Unicar, which is designed for long-haul journeys, said Al Tayer. “It features a design compatible with the urban setting and international standards of Dubai. These ultra-modern innovative systems have the potential of enhancing smooth mobility through the construction of an elevated network connecting high-rise buildings. Each pod has a capacity of four to six seated riders and can travel at a speed of 150 km/h,” he explained. The new Sky Pods occupy “considerably less area than conventional systems of the same capacity”, according to the RTA. They are have higher power efficiency as they use five times less power than electric vehicles. The Sky Pods initiative is part of the Dubai autonomous transportation strategy – which is aimed at converting 25 per cent of total journeys in the emirate into autonomous journeys on various transit means by 2030. “It is also part of RTA’s efforts to enhance the integration of public transit means, and offer solutions for short journeys (first and last mile) enabling public transport users to reach their final destinations,” added Al Tayer.